Today’s topic is Residential Energy Saving Tips. Download the Spotlight Page focused on Energy Savings tips. We all know, energy efficiency is not the most exciting topic but frankly it can be when you convert the topics that we’re discussing into dollars and cents. And if it’s only $5 a month and that’s all it ever is people are not going to pay attention. But when you take the body of work of what’s been accomplished in energy efficiency just over the last decade it is a huge amount of change and that change is affecting literally every household. What I mean by that is for those that take advantage of energy saving options maybe one in and of itself that isn’t that noticeable. But when you take one and go to two three and four, put them all together then it does become something. From this list that we’re going to talk about today all of them may not necessarily be of use to you but I’m going to guess that three or more will be. Towards the end of the program we’ll talk about programmable thermostats and some websites where you can get more information on high efficiency air-conditioners. We’ll also talk about water and the cost of that. So please stick around through the end of the show. As usual it is our standard 20 minutes or less so you get all that in. Today’s topic is Residential Energy Saving Tips. By residential I mean the tips we’re going to cover today can be applied to residential single-family and or multi-family. Both are occupied by us humans, so we’re not talking about warehouse or cold storage, just energy saving tips that we can apply to our daily lives and sometimes to our business, if in fact we’re in the multi-family residential business. Starting with number one, Lighting. We know that LED light bulbs have been around for close to 10 years now (invented in the 1960’s, perfected in the late 1990’s) and they have made an impact. 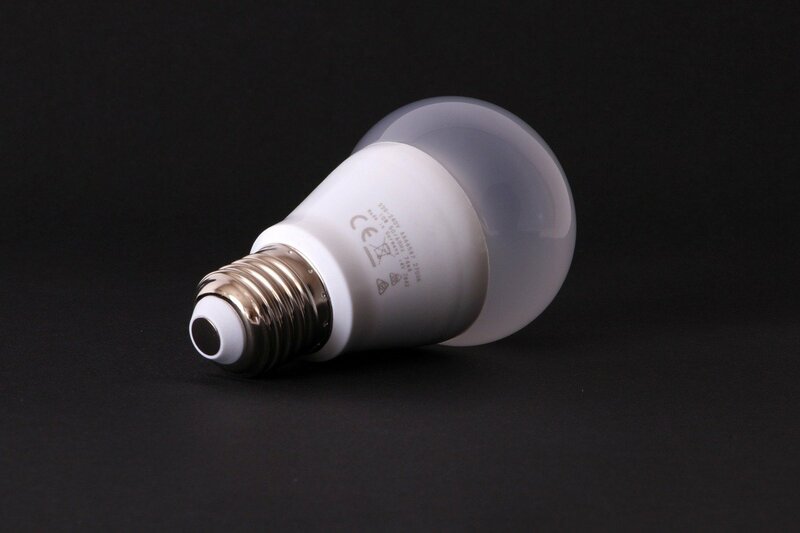 You can see significant savings by just changing from older style light bulbs, which are almost hard to find these days, to standard LED light bulbs of any sort whether it’s 40 60 or 100 watts. In addition to changing to LED, remember to think about the lighting needs for an area; every area doesn’t necessarily need a 100-watt bulb. I’ll give you an example. In my household, we have several areas where we use three-way lights. There might be a light there all the time but sometimes it’s on 40 or 60 versus 100 if someone’s trying to read. Item number one is lighting. Look at using LED lighting as a standard even if you just have to change them out over time because they are kind of pricey. Take your time and change them out as old bulbs go out. You will see a measurable difference in your electric bill on that one single item. Second is utilizing advanced power strips. Just like every other technology, power strips have changed dramatically over the last 10 years. Looking at new power strips will reflect some positive savings in energy usage. The next is laundry. By laundry I mean any washer or dryer. What most people don’t know is that we don’t gain that much by using hot water even when washing white clothing. It’s plausible to use cold water in just about all laundry usages. Where that may not seem like much, every five-dollar bill helps, right? If that’s a $5 savings per month over the course of a year that’s $60. But over the course of 10 years it’s $600. It does add up, using cold water for laundry. I know it’s hard to think that way based on how we all are trained to use hot water for white clothing and warm and cold for others but just give it a try and see if you see any difference just using cold water. Next on our list is window coverings. And yes, most of us use blinds, sometimes curtains, but there are different thicknesses and there are different methodologies that are imputed into blinds these days. In other words, there’s even high tech in blinds. Take a look at those options. Maybe it’s not cost effective all the time but it could be a section of the house, or based on the way a house faces, that there is some potential savings from a one type of window coverings. Take that into consideration. Maybe not throughout the entire structure but just on that side of the structure that sees the most sun over the course of the season. Next is making sure that there’s two-way air flow or unobstructed air vents. Every air-conditioning system requires a two-way air flow meaning that systems require air coming into the system before it can push it out so that it cools or heats appropriately. People have obstructions such as furniture floor mats, pictures sometimes hanging over a vent, that obstructs that air flow and whenever that’s true then the system has to work harder or the worst case scenario is it stops working. The system works harder when air vents are obstructed particularly, intake air vents. That’s something else to watch for. Collectively, energy savings tips, they’re not going to add up to enough to send your kids to college but they may pay for a nice vacation. Maybe it’s only a three-day vacation but that’s money that you can put towards something that you would like to do in life versus just paying electric bills for your property that you live in or for a multifamily commercial property. What we’re talking about is reducing expenses and you’ll hear me discuss this theme throughout my podcast. I call it G.R.A.C.E with respect to commercial property assets and how to run them. We want to Grow Revenue And, Control Expenses. This program on energy saving tips falls into the “CE” side, which is controlling expenses. Next is using Energy Star electronics and appliances. This is a pretty standard anymore. You have the option of reviewing the Energy Star rating of electronics and appliances and review potential savings. I can tell you that GE Appliances is one company that makes an overt effort to advertise and make sure that everyone knows the energy efficiency and Energy Star ratings of their products. I’m not recommending GE over every other supplier. I am saying that they do a good job of reflecting the Energy Star rating of their products. [00:07:35] Let me just take a second and explain what ENERGY STAR means. An Energy Star rating is something that conveys that this appliance or electronic, reflects the least environmental impact as compared to other alternatives. That’s the shortest of versions of what Energy Star means. It’s trying to tell us that a product uses less energy than other competing products. And with that there’s certain ratings that can tell you exactly how much that is. Next on our list is fans, ceiling fans or oscillating fans, for re-circulation. I’m not suggesting replacing air conditioning or heating with fans. I’m suggesting using fans as a helpmate to circulating the air because it does move air around, the hot and cold. With fans, perhaps we’re using just a little bit less energy than we would otherwise. (Fans costs about one penny per hour to operate versus 36 cents per hour for air-conditioning). Something else to consider is appropriate landscaping. We’re talking about energy saving. With appropriate landscaping, we are watering less and very likely using less maintenance. Those are two areas within landscaping that can have a major impact on costs. The next two items are big areas within the industry of energy saving. We’re going to spend more time on these than we have the rest. The first one is the use of programmable thermostats. Some come with Wi-Fi today. There’s a lot going on there beyond just something that turns on and turns off itself. With the programmable thermostat, we have better options in terms of using zoned heating and cooling and using split systems whereas with systems prior you would just have several remotes for turning on and off a room. With programmable they are sophisticated enough where even if they’re not working at their maximum for you can still see five to 10 percent savings in energy when implementing a programmable thermostat. Everyone knows about Nest. That’s the biggest name, that’s the 800-pound gorilla in the programmable thermostat space but they’re not the only players. Look at Nest but also look at their competition and see what works best for you. Look for high efficiency and functionality with programmable thermostats. High efficiency should convert to somewhere between 5 and 10 percent annualized savings as compared to not using a programmable thermostat. If you want to go to the next level beyond using a programmable thermostat, we’re talking about installing high efficiency air-conditioning units. These are relevantly new and they are expensive but the energy savings can be as much as 20 to 50 percent. There’s a number of companies that offer high efficiency air-conditioning systems. One of the places you can go to find out more about high efficiency air conditioners is Energy.gov. Another place to look is a Web site called EnergyUpgradeCA.org. The website has good information for energy users in California. We’re using it here because there’s more people outside of California that can benefit tremendously from the energy saving tips they reflect on their website. That’s Energy Upgrade CA.org. Last, but not least is water. I’m saving water for last because as a residential user everyone uses water and we need it for all the purposes we all know. If you’re a homeowner you have a lot of control over your water usage. If you are a resident of a multifamily property you to have control over your water usage. But you don’t have control over what your water cost and I’ll tell you why that is. Five years ago I would say that 5 out of 10 multifamily assets had what’s called sub-metering. Today, that’s more like 8 or 9 out of 10. Every individual multi-family unit of size will have sub-metering which allows the owner of the property to charge individual units based on usage. That’s fine. That’s another way to conserve water for the property and for the planet. I understand that. But here’s the kicker: it’s still a relatively new industry. Like I said, five years ago, not even half of multifamily properties would have sub-metering and now it’s a very high percentage. The issue I have with sub-metering is because it’s still in essence the Wild West, property owners are charging whatever they want. That has some far-reaching impacts for you the resident because in some properties, where the rent may be exactly the same, water billing may be 50, 100, 150 percent different between one property and the next. I’m suggesting that if you’re looking for an apartment to rent, as you go over the expenses, rent of course is one of those, there are other expenses and water sub-metering will likely be one of those going forward. So take a look at that as a part of your comparative analysis when you’re looking to rent an apartment. I’ll give you an example from a recent survey that I accomplished in a sub-market in Atlanta. There were about 10 properties within the sub-market. Nine out of 10 had sub-metering. The differential between property A versus property B was $25 to $30 dollars on the low side, in terms of average usage or payment by the resident for water. The high was $69 per month at a different property where the rents were the same but the cost of water was exponentially different. Something to consider when looking at water and looking at water savings. As a renter, it’s a cost that you have some control over just based on being aware of what the cost is before you sign a lease. Visit Water.org to see how the other half lives. Water.org will make you appreciate the availability of water in the U.S. as compared to other parts of the world. Potable water truly is a gift and not a right. That’s our short list of 10 items for 10 residential energy saving tips. You can see whether you’re a homeowner, a renter or a property owner, there is something on this list for everyone to take advantage of and reduce your monthly expenses with respect to energy. Thanks for listening today. This is John Wilhoit on John Wilhoit on Real Estate. Download the Spotlight Page focused on Energy Savings tips.